Let's start with something small. It doesn't get much smaller than the new creation out of Edinburgh University. The assembly works on the scale of nanometers, about one 80,000th the thickness of a human hair, and it was 140 years in the making. It began as a hypothetical question posed by brilliant mathematician and physicist James Clerk Maxwell. He pondered the possibility of violating the second law of thermodynamics through the intervention of a hypothetical "demon". This demon, being small enough to control individual molecules, could cheat the laws of physics and arrange molecules away from their normal state of entropy. Known as Maxwell's Demon, this thought experiment has been fodder for chemists and physicists ever since. Thanks to Professor David Leigh and his team at Edinburgh, the demon is no longer the stuff of fantasy. Professor Leigh has created a nano-engine that can move a chemical system out of equilibrium. This tiny wonder works on very simple albeit very small mechanical principles. Leigh constructed an assembly of rotaxanes and put them to work. A rotaxane is basically a long barbell shaped molecule threaded through a second ring shaped molecule. The ring molecule moves chaotically from one end of the axle to the other, but cannot pass over the ends of the barbell. With many of these rotaxanes in parallel, on average you will see an even spread of the rings along the barbells. Some at one end, some at the other, some in the middle. That is until Dr. Leigh turns on his machine. By shining a beam of light into the device, the axles of the barbells change shape in the presence of the rings. If the ring is on the right for instance, the axle thickens, trapping it there. If the ring is in the center, or left, the axle remains narrow enough for the ring to continue moving. In short order you end up with the majority of the rings on the right side... Order from chaos. Now, this machine doesn't violate thermodynamics of course, because it requires a light beam as a power source. But it does arrange molecules using only their natural motion. Something that up until this moment has occurred only in nature. Dr. Leigh has succeeded in building a workingNanomotor, driven by nothing but light. 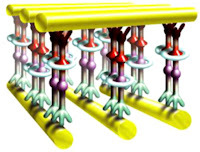 Motors like this, that manipulate individual molecules are a prerequisite to creating fully functional nano-constructors. This is a stepping stone to the machines that will construct our future, one molecule at a time. They may take the form of VonNeumann machines that will replicate and build in trillion member swarms. Or more likely, we will see Leigh's technological descendants toiling away inside a future desktop factory like the one in this STUNNING VIDEO. That particular conceptual animation is courtesy of Nanorex. Nanorex is a company local to Michigan that is working with K. Eric Drexler himself, the godfather of nanotech, to devise new microscopic miracles using cutting edge open source software. Oh, and they render them using distributed computing technology. Nanomachines, open source, and distributed computing, I have no idea how they fit so much awesome under one roof. Check out their gallery for more infinitesimal goodness.